Skydive Australia is the largest and most professional skydive company in Australia. And offers thrill-seeking tourists from around the world the perfect excuse to jump out of a plane over five of the most breathtaking and unique locations around Australia. Skydive Australia's mission is to provide the ultimate experience life has to offer, by providing the very best in safety, service and professionalism. Skydive Australia boasts world wide recognition for its high standards of safety and customer satisfaction. Skydive Australia, currently operates at 16 unique and spectacular locations across Australia. In Queensland they operate in Cairns, Mission Beach, Airlie Beach and Brisbane. 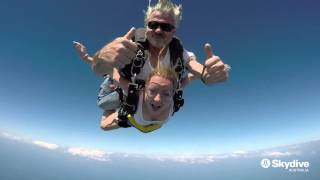 A tandem skydive is the easy way to experience all the thrills of skydiving with the comfort of having a highly experienced, qualified instructor with you to control the free-fall, parachute deployment and steering, all the way down to your soft landing. It's addictive, it's fun and it's easy. 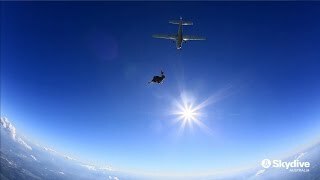 Skydiving with Skydive Brisbane, is an exhilarating, adrenalin pumping, unforgettable adventure that leaves you feeling high (up to 15000 feet high!) - even after your feet have touched the ground! Their Redcliffe drop zone is nestled between two of Brisbane's most beautiful landmarks - Moreton Bay and the Glasshouse Mountains, offering spectacular views and beach landing on beautiful beaches. It's fun, it's easy and it's addictive! Trip highlights include personalised training and instructions, soft beach landing on beautiful beaches, views over Brisbane, Moreton Bay and Glasshouse Mountains, free city transfers, Jump Certificate and the thrill of a lifetime! Experience the adrenalin rush of 60 seconds free fall from up to 15,000 feet - the highest jump in Australia with the most spectacular views. After receiving all personalised training and instruction, travel by air-conditioned bus transfer to airport. Enjoy the scenic flight up to 15,000 feet height and jump out of the perfectly good aeroplane. You experience the exhilarating free fall for 60 seconds (your freefall speed is over 200 kilometres per hour). The parachute is deployed and you fly under the canopy for another four to five minutes with the opportunity to steer your own parachute with amazing views of the Great Barrier Reef, heritage listed rainforest, Trinity Inlet and tropical Cairns. Skydive Australia provides the experience of a lifetime at locations to suit all tastes. Tandem skydiving is fun, it is affordable and easy. If you're looking for the best location to Skydive, do it in Mission Beach with Skydive Mission Beach! Offering Australia's highest jump (up to 15,000 feet), paired with the most idyllic landing on shimmering sands of Mission Beach, it is adrenaline packed with the views of the Great Barrier Reef, tropical Islands and Rainforest. Without a doubt Australia's best drop zone and the unforgettable experience of your lifetime. 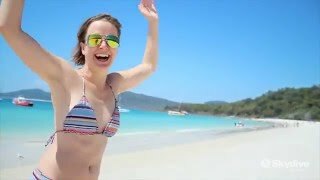 Trip highlights include courtesy transfers from Cairns and Mission Beach, spectacular landing on 14 kilometres of pristine beach, photo certificate of your skydive, personalised training and instructions, scenic flight and spectacular views of the Great Barrier Reef, rainforest and tropical islands and a soft landing on the beach. Skydive Airlie Beach is in the heart of Queensland's most popular tourism spot - the Whitsunday Islands. Just minutes from the beautiful town of Airlie Beach, they provide free return transfers to your accommodation. Skydive Airlie Beach and jump from the incredible altitude of up to 15000 feet directly over the crystal clear waters and sparkling white sands of the Great Barrier Reef and the Whitsunday Islands. Experience the ultimate thrill of free-fall at over 220 kilometres per hour for up to an insane 70 seconds, and then float under canopy for five to seven minutes soaking up breath-taking views of Airlie Beach, Whitsundays and Whitehaven Beach. Skydiving Airlie Beach must be the most spectacular skydive in Australia!